Travel New Brunswick and you will see big industry in the cities of St. John and Moncton. Hit the byways and you will find those big hearted, industrious, self efficient folks who are ready and willing to meet you and greet you in both English and French languages. This most westerly Maritime province is quite small compared to the huge provinces, but don't let that fool you. With less than 800,000 people, New Brunswick has plenty of open spaces and a lot of forest land. The province is easily traveled as the Trans Canada Highway from the province of Quebec border follows the northern border of Maine east to Woodstock where you may enter Maine at Houlton. The highway then cuts east to the vibrant city of Moncton and shortly after you arrive at the City of Sackville at the entrance of the province of Nova Scotia. From Moncton you may travel on highway #1 to St. John, the other industrious city lying on the shores of the Bay of Fundy. Highway # 11 takes you from Moncton to Campbellton along the eastern side of the province when you travel New Brunswick. Whatever you do, be certain to take this route as it is not only beautiful but the people are very industrious in small ways as you will see when you discover their small towns and villages. The Miramiche river is a world class salmon fishing river. Be on the alert for she signs along the highway indicating the many artisans and craft shops where you may view and purchase some of the finest crafts you will ever find. The name Kouchibouguac National Park (Kou-she-boo-gwack) is of Mi'kmaq origin and means "river of the long tides". You will love this park and the great campground as you travel New Brunswick. It is very popular so take advantage of the reservation system so you are not disappointed. The park has 15 miles of sand dunes along the bay and features 36 miles of hiking and bicycle trails and is also a very popular cross country ski center in winter. You will enjoy the beautiful log cabin style cooking shelters on a damp day. Located off the highway # 1 Between Sussex and Moncton, Fundy National Park is beautiful. It has terrific camping facilities and plenty to do and see. 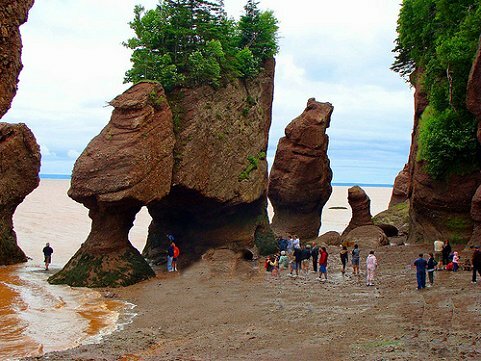 Did you know that the Bay of Fundy has the highest tides in the world. Do not miss seeing the tide come in faster than you imagined. Caused by these extremely high tides, the land has eroded over the millions of years to create these amazing sculptures called the flower Pots. It is one thing to walk along the shore and mingle with the pots but make certain you are back above the tide when it comes in. While in this area businesses offer Tidal Bore riding which is incredible. Be sure to look them up for an exciting ride as the tide comes in. Just off the highway at Moncton be sure to stop at Magnetic Hill. Here you will experience an amazing optical illusion. Stop your vehicle, place the gear shift in neutral and see what happens. Once you travel New Brunswick you will certainly want to visit these other great Canadian provinces.